What is a neutrino and why do they matter? 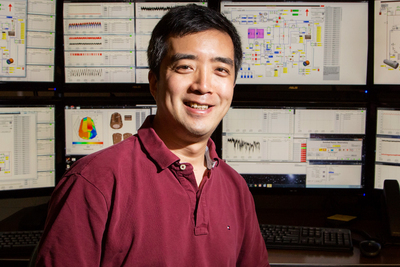 Illinois physics professor Liang Yang discusses the significance of the recent neutrino detection in Antarctica and what it means for the future of observational astronomy. Scientists recently announced the discovery of a subatomic particle that made its way to Earth from an event that occurred 3.7 billion light-years away. Sensors buried within Antarctic ice detected the ghostly cosmic particle, called a neutrino, and traced its origin to a rapidly spinning galactic nucleus known as a blazar. Physical sciences editor Lois Yoksoulian spoke with physics professor Liang Yang about the significance of the discovery. Neutrinos are the second most abundant elementary particles in the universe after photons. Even though billions of them pass through us every second, we would not notice them because they rarely interact with matter. This property makes them one of the most elusive and mysterious elementary particles. On the other hand, they can traverse a vast distance without bumping into anything, which makes them an excellent probe for astrophysical phenomena deep in the universe. Much of the news coverage about this discovery discusses how this will advance our understanding of cosmic rays. What are cosmic rays and how are they related to the neutrinos? Cosmic rays are the energetic particles constantly bombarding Earth’s atmosphere. They mostly consist of protons and can have energies more than a million times greater than what scientists can produce even in the most powerful accelerators on earth. We knew that the ultra-high energy cosmic rays come from outside our galaxy, but we did not know where they came from because they do not travel in straight lines. This question has puzzled scientists since the first observation of cosmic rays more than 100 years ago. However, it is very likely that the processes responsible for the acceleration of cosmic rays are also responsible for the creation of ultra-high energy neutrinos. Because neutrinos travel in straight lines, we can determine the direction of their sources. Shortly after the IceCube Neutrino Observatory detected the high-energy neutrino in 2017, telescopes were able to locate a distant gamma source called blazar in the same direction. Furthermore, by analyzing recorded data in the past, more neutrino and gamma events were identified from the same blazar. Since high-energy neutrinos are created from proton collision with gas, determining the blazar as the source of the high-energy neutrinos tells us that blazar is also a source of high-energy protons, i.e. the cosmic rays. This marks the first time that scientists have been able to pinpoint a source of ultra-high-energy cosmic rays. What is the IceCube Neutrino Observatory and how does it detect neutrinos? The IceCube Neutrino Observatory is the largest particle detector ever built. It consists of one cubic kilometer of ice in Antarctica and 86 strings of light sensors buried inside the ice. When, by chance, a high-energy neutrino crashes into a nucleus of one of the atoms that make up the ice, it can generate a stream of secondary particles. These secondary particles, in turn, create a burst of blue light detected by the light sensors. From the energy and direction of the secondary particles, we can infer the energy and direction of the original high-energy neutrino. Why is the detector located in Antarctica under ice? Because neutrinos interact very weakly with matter, we need gigantic detectors to "see" them. The polar ice cap turns out to be a perfect medium for such a detector. Unlike regular ice, polar ice has almost no impurities or gas bubbles when under enormous pressure deep inside the ice cap, allowing the light signals to travel a long distance with minimal interference. Such an ideal condition is only available in Antarctica. Meanwhile, scientists are looking at other creative ways to detect ultra-high energy neutrinos. What are the major implications of this discovery? The recent discoveries made by IceCube and other instruments like the Fermi Gamma-ray and MAGIC telescopes demonstrate the power of observational astronomy. It is only through the observation of both neutrinos and high-energy photons that scientists are able to uncover the mystery of cosmic rays. Astronomers are now armed not just with optical telescopes for photons across the entire electromagnetic spectrum, but also gravitational wave detectors and neutrino telescopes. Together, they will help us tackle big questions such as the origin and evolution of the universe and the nature of dark matter and dark energy. Many exciting discoveries await. To reach Liang Yang, call 217-244-2792; liangyg@illinois.edu.